If one historically traces the ideology guiding the BJP and the Sangh, one can notice the deep impact of Brahmanical hegemony on them. Soon after the PM’s condemnation of the Una incident in his post “Mann Ki Baat” address, the RSS also criticised the attack on Dalits. The timing of the two statements, show the weakness of the conviction behind it. The attack on Dalit youth in Una took place on July 11 and the Prime Minister spoke against it only on August 7. Both the statements were made almost a month after the Una incident. RSS's “seriousness” is also evident from the fact that, along with condemnation, it added that the “Prime Minister should have not called 80 percent Gau Rakshaks fake”. It is also to be noted that while the VHP chose to remain officially silent, they and Bajrang Dal members tweeted “Garv se kaho hum gorakshaks hai”, a play on their trademark slogan “garv se kaho hum Hindu hai”. But nevertheless, the question that one must ask is, are the Sangh and BJP actually concerned about the atrocities on Dalits? Are they serious about the question of caste? One needs to look back a bit to find the answers. Despite speaking against caste atrocities, RSS has published thousands of copies of this book and follows it line by line. “To this day his laws as enunciated in the Manusmriti excite the admiration of the world and elicit spontaneous obedience and conformity. But to our constitutional pundits that means nothing" (Organiser quoted in Empire and Neoliberalism in Asia, pp 252). The “Guru Ji” of RSS (Golwalkar) had fondly quoted Manu as ‘ Bhagwan’ and the ‘ greatest law giver’ in many of his texts. He not only called Manu the supreme law giver but has also referred to him at various places to cite the supremacy of Brahmins. It is the Manusmriti that designates corporal punishments for the lower castes. 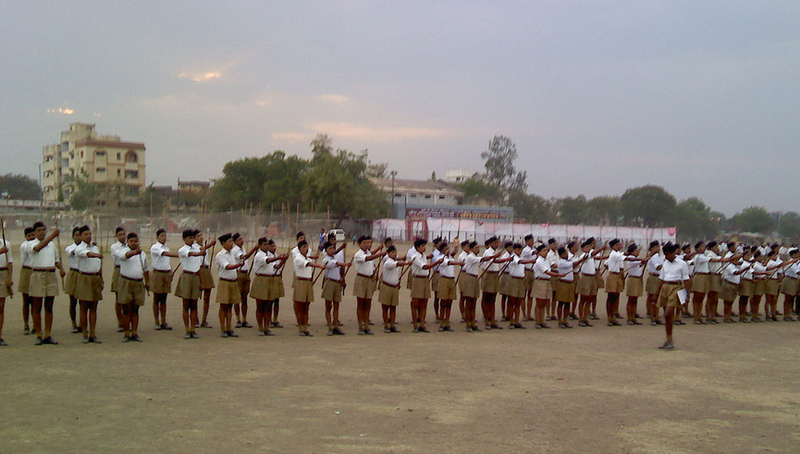 The disagreement of RSS with the Indian constitution is in the public domain. The anti-Dalit agenda of the RSS can be traced in its demand for the review of the reservation system. Both the RSS and the BJP opposed the Mandal Commission's recommendations. So the question is why has RSS/BJP suddenly developed love for Dalits? The only answer is the upcoming elections in Uttar Pradesh. If BJP loses UP, it will not be able to have majority figures in the Rajya Sabha or the upper house. It will also let out much of the hot air from Modi's ‘Achhe Din’. Uttar Pradesh has 20.5 percent of Scheduled Castes (SC) population, which has traditionally voted for the BSP. However, the statistics of Lok Sabha elections 2014 were quite different. Out of the 66 reserved Dalit Lok Sabha constituencies, the BJP won 40 seats. Not only this - it won all 17 reserved constituencies in Uttar Pradesh. But the suicide of Rohith Vemula, the Una atrocity, the personal attack on Mayawati and demands for the review of reservation by RSS, has made them vulnerable in UP. Both BJP and RSS are now desperately trying to contain the surging Dalit ire. But one must not forget that at the core of their ideology, lies a deep-seated anti-Dalit agenda.